Happy Thanksgiving everyone! Thanksgiving is my favorite holiday and every year I have so many things to be thankful for. But, this year on the blog I'm fast forwarding through Thanksgiving and moving on to Black Friday! Better late than never, but I wanted to make sure this post went up so you all could take advantage of this weekend’s sales! As a beauty lover, I know that makeup can be expensive. The older I get, the more I want to invest in quality products but I have to accept that it’s unreasonable to keep to buying small variations of the same products all the time (how I ended up with 4 gold highlighters, I’m not sure)! This is a list of some of the beauty products on my ‘treat yo’self’ list. I thought it would give you some inspiration for your holiday wish lists or ideas into what to gift the beauty lover in your life. The best part being that most of these items can be found on sale somewhere from now until Monday! This refreshing face primer keeps your makeup in place while nourishing and hydrating your skin! This powder is great for brightening your face, as well as keeping your makeup intact throughout the day and creating a flawless finish! I’ve wanted the OG Ambient lighting highlight palette forever, but ever since Hourglass released the new and improved, vegan edition it’s all I can think about! I mentioned in my everyday, natural makeup post that I was looking for a tinted moisturizer and this one comes highly recommended! Plus, I’ve yet to try a Glossier product despite the hype so why not try this one first? 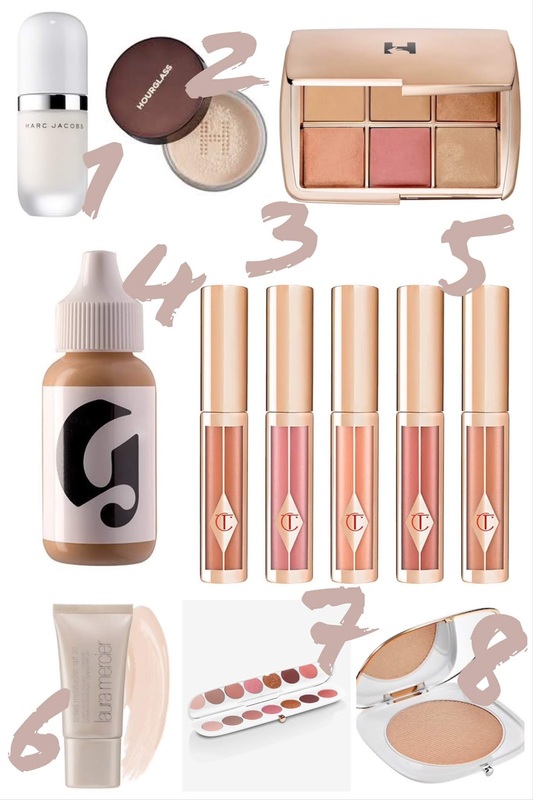 I’ve heard great things about Charlotte Tilbury’s lipsticks and all of the shades are beautiful! Again, I’m in the market for a tinted moisturizer this one comes highly recommended. Plus, it has SPF! Another Marc Jacobs Beauty products, I’ve been lusting over this palette for a few months now and I’ve decided that there’s nothing in my collection that I would use more! It’s a great travel palette as it’s small and you can create numerous different looks with just a few shadows. Clearly, I’m having a Marc Jacobs Beauty moment; I know I said I already have 4 gold highlighters but my collection won’t be complete until I have this one - I mean look at it in all of its shining glory! I hope you all had an amazing Thanksgiving, and now..happy shopping!